If you are building a report to compare team on team or any category on category results, there are chart types available to simply reflect these results. These chart types are recommended for reporting on metrics in relation to attributes (categories). A bar chart is constructed similar to a column chart and displays results from left to right. Attributes on a bar chart are displayed on the Y axis, while metrics are displayed on the X axis. If you are building reports with sorting or benchmarking, viewers can compare results against each other easily. 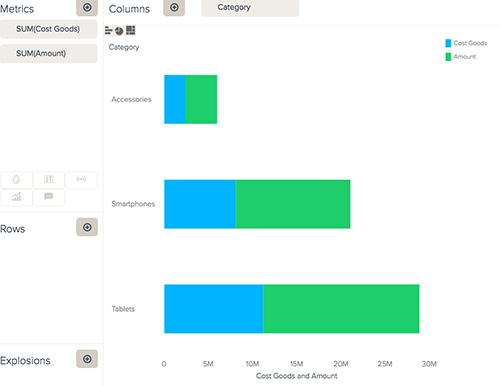 Bar charts display results on a grid, you can add trend lines to track increases or decreases. In Colors, you can edit the grid, background, and individual metric colors. In X axis and Y axis, you can edit text style, alignment, label format, min/max values, and visibility. In Trend line, you can add and edit your trend lines. Adding a trend line in the Chart configuration menu will show trend lines for each metric. To show a trend line for only one metric, see Adding metrics as a trend line . In Chart, you can create stacked results, so multiple metrics will be combined into one column. 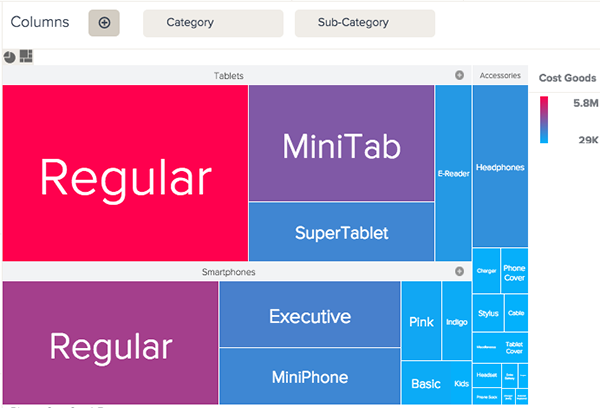 A treemap is useful for comparing several results at the same time. 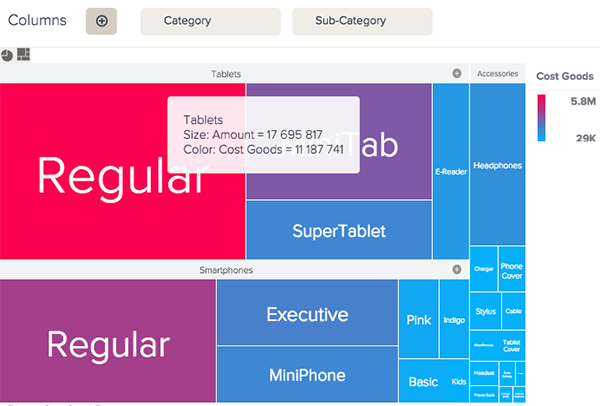 If you add more than one attribute to Columns, a treemap will show results in a hierarchy. The first attribute's values will group the second attribute's values, the second will group the third, and so on. The last attribute's values will be the tiles. You can rearrange the hierarchy by changing the attribute order on Columns. The values for each group will appear as a title bar over the tiles. 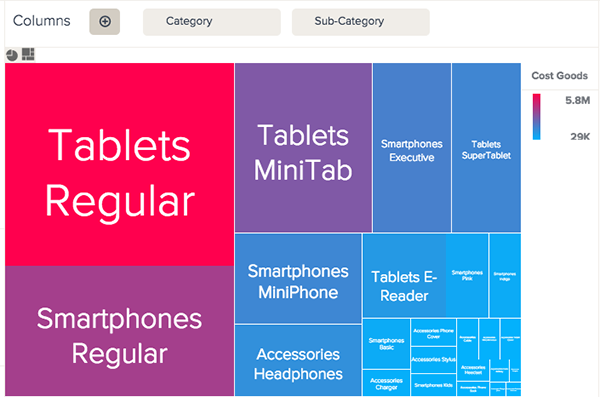 If you hover over a title bar, the treemap will show you overall results for the attribute. If you only want to view results for a select group, you can click the + icon on the title bar to zoom in. You can click the - icon to view all results again. 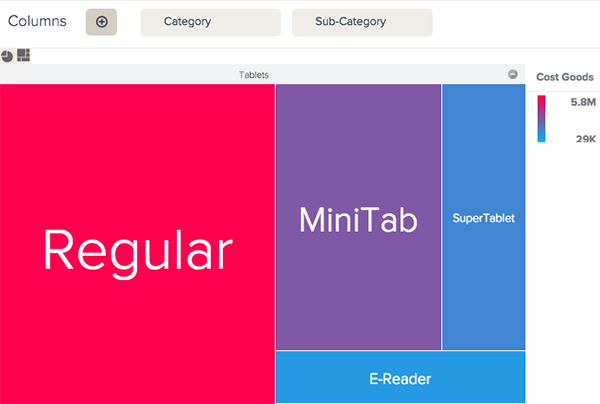 In Colors, you can edit your treemap header, text, and background colors. In Chart you can change to the classic view by selecting Classic from the Treemap version drop-down list. If your attribute contains several different values, you can use a bubble pack to easily identify the largest and smallest results. Bubbles will vary in size, depending on the number of results a value contains. 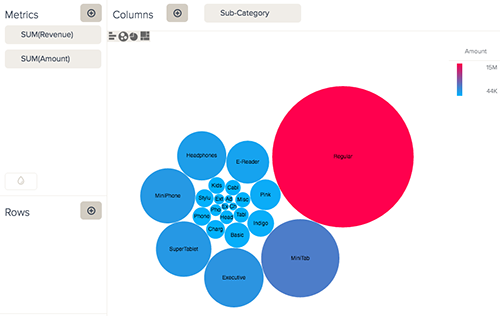 Bubble packs work better when there is a limited number of attributes and metrics on your query frame. If you add multiple metrics to your query only the first two will appear. The first metric will represent the size of the bubbles, and the second metric will be color-encoded to show the difference in results based on a color gradient. The second metric is color-encoded by default, and the Color icon will not appear next to the query name. Any subsequent metrics you add will not be visible on your query. In the image below, Amount is added as a second metric to the query frame. If you add multiple attributes to your category, more bubbles will appear, so results are sliced by every possible combination of the added attribute values. The bubbles will only show the value names for the attribute added last. You can hover over a bubble to see what other values are slicing the result in a datatip. If you do not see a datatip, ensure that the Show datatips box is checked in Chart configuration > Datatips. If you do not have Flatten hierarchy checked, your second attribute values will be split into circles for each of your first attribute values. 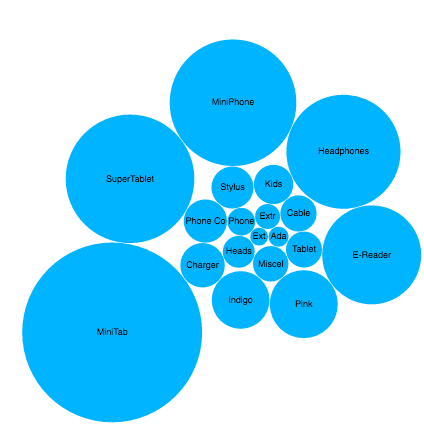 In Chart, you can check Flatten hierarchy to show all of your results together, rather than grouped into circles. You can also arrange your options in either ascending, descending, or no order in the Ordering drop-down list. In Colors, you can select a background color and color encoding options. If you unchecked Flatten hierarchy, you can select the colors for the circles grouping your results in Node color. 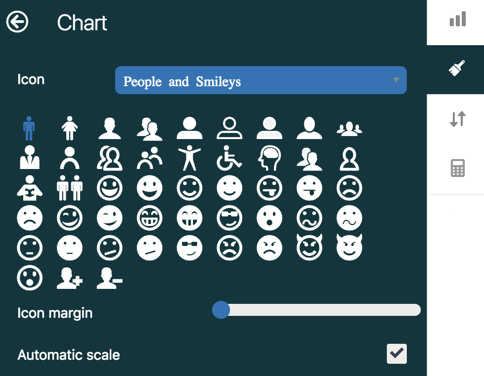 A picto chart enables you to visualize differences in each values using images or symbols. 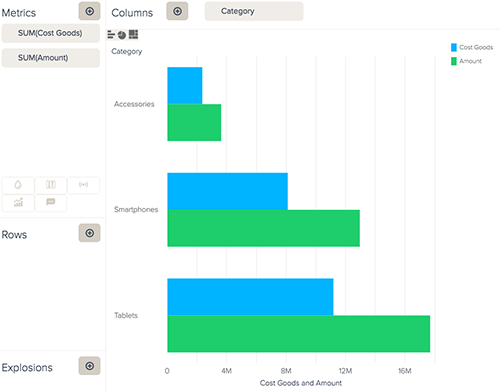 Picto charts function best using one metric and one attribute with a small number of values. 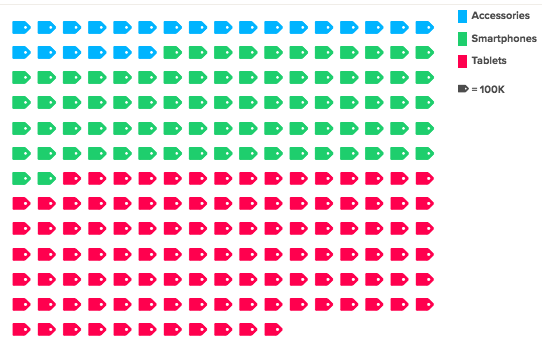 In your chart legend, you can see what colors correspond to what values and the approximate number each image represents. You can change where your legend is located and the text style in Chart configuration > Legend. In Chart, you can select a new image to represent your results. Images are divided into different categories. You can select a new category from the Icon drop-down list. You can also edit the amount of space between each icon by dragging the circle on the Icon margin bar. Each image is automatically assigned a value, but you can uncheck Automatic scale to enter a new number to represent each image. In Colors, you can change the background color and the image color. If you check Automatic color, your values will be assigned colors.